Talks between Russian President Vladimir Putin and Chinese President Xi Jinping last week ended with the signing of several deals. Perhaps the most important document concerns the leaders' joint declaration on their readiness to unite the Moscow-backed Eurasian Economic Union with the Chinese Silk Road Economic Belt. Besides the photographs taken during the Victory Day Parade on May 9 of Vladimir Putin with Xi Jinping sitting next to him, besides the Chinese soldiers marching on Red Square, which became the most important symbol of the Chinese leader's visit to Moscow, the talks between the two leaders also resulted in many commercial agreements. Beginning in May 2014, when due to the crisis in Ukraine and western sanctions China started playing a major role for Russia, the signing of a large number of documents each time the two leaders meet has become a tradition. On May 8, the two countries signed 32 agreements in the Kremlin. The most significant block concerns the access for Russian companies to Chinese financial platforms and instruments, first of all credit lines in yuan. Moscow and Beijing have been planning to leave the dollar and euro in mutual payments since the middle of the 2000s. Against the backdrop of western sanctions and Washington's talk of possibly denying Russia's largest banks correspondent accounts in the US and the EU, in the event of escalation in Ukraine. This has made transactions in alternative currencies a vital necessity. Therefore, even though China's currency is not freely convertible, Russia is still moving towards an increased use of the yuan. According to Vladimir Putin, as of the beginning of 2015 the share of transactions in national currencies makes up seven percent of the trade volume (in 2014 it was about $89 billion, according to data from Russian customs agencies, and according to the Chinese, $95 billion). Agreements on loans in yuan were signed by Sberbank (6 billion yuan from the State Development Bank of China), VTB (12 billion yuan from the State Development Bank of China and 3 billion from the Export-Import Bank of China) and VEB (3.9 billion from the Export-Import Bank of China for the metallurgical project in the Kemerovsky Region). Moreover, the Russian Direct Investment Fund signed agreements on the creation of a joint investment bank with structures from the CITIC group for bringing Russian companies to Chinese platforms, while with the China Construction Bank it signed an agreement on a joint credit mechanism that will facilitate Chinese investments in projects on Russian territory. Unlike previous agreements, the countries did not sign anything serious in the field of energy. Gazprom and CNPC signed an agreement on the main conditions for supplying gas to China along the "western route." On November 10, 2014, the sides had already signed framework agreements on gas supplies along the "western route." The history of the "eastern route" (the Power of Siberia gas pipeline with the resource base in the Chyandinsky and Kovyktinsky deposits) has shown that several years can pass before the commercial gas contract is signed. Obviously the aim of the new document is to send a signal to European Gazprom gas consumers. On April 13 in Berlin, Gazprom Chief Executive Alexei Miller talked about a new "Eurasian strategy" monopoly and called on the EU to decide if the European market will need the Russian resource base and infrastructure, alluding to the possibility of redirecting supplies to China. However, in the foreseeable future China will not replace the European gas market for Russia. Even if the "western" and "eastern" gas supply routes are built in China, their total power capacity after 2020 (and these scenarios are the most optimistic) will be 78 billion cubic meters a year, compared to the 146 billion cubic meters that Gazprom sold Europe and Turkey in 2014. Not to mention the price: while the price of gas through the "eastern route" is equal to that which Germany pays (although the price formula is not transparent and can change depending on whether Gazprom will need Chinese credit to finish the Power of Siberia), the Chinese are still not ready to pay more for gas coming through the "western route" than they already pay for cheap Turkmenistan gas (about $150 per 1,000 cubic meters less than what Gazprom wants for gas from Western Siberian deposits). Under these conditions, the most important document has proven to be Russia and China's joint declaration on the unification of the Eurasian Economic Union (EAEU) and the Silk Road Economic Belt (SREB). The document points to the Shanghai Cooperation Organization as a coordinating platform for dialogue between the two initiatives and also mentions "the review of the long-term objective for promoting the free trade zone between the EAEU and China." 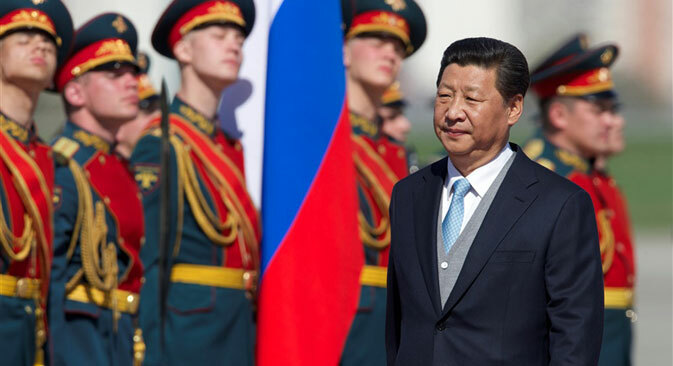 Thus, for now Moscow and Beijing have reached their tactical objectives: both integration initiatives are reciprocally recognized as partners, while the delicate issue of the free trade zone will be left for the future. The unification of the two projects could be advantageous for both Moscow and Beijing. Russia will receive access to resources from the Silk Road Construction Fund ($40 billion) for the development of its agriculture, while China will obtain a reliable transit route to Europe, one that has no political risks and is supplied with instruments from the Customs Union (there are only two customs borders between China and the EU). If the countries realize these initiatives, Moscow and Beijing will create a condominium in Central Asia in which Russia will be the guarantor of security and China - the largest economic player.